Lichfield Antiques Centre is based in a charming and picturesque Grade II Victorian building by Minster Pool, under the three spires of Lichfield Cathedral. 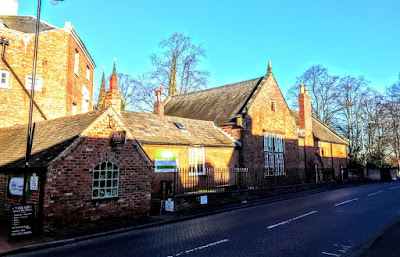 The former Saint Mary’s Infant School on Minster Pool Walk was first built as the Lichfield Diocesan Training School and Commercial School in 1840, and is an important work by the Lichfield architect Thomas Johnson. The school was used by Saint Mary’s Schools from 1863-1981 and by Lichfield Cathedral School until 1989. This was first built as the Diocesan Training School for Masters and Commercial School. The diocesan board of education established the training and commercial schools for boys in 1839 in a rented house on the corner of Bird Street and Pool Walk. In 1840 it bought the adjoining house in Bird Street and built a single-storeyed schoolhouse in an Elizabethan style behind the second house to the design of the Lichfield architect Thomas Johnson. The new institution was intended for the sons of farmers and tradesmen. The curriculum of the commercial school, mainly for day boys, included book keeping and technical drawing. The staff also trained teachers for national and commercial schools. They were boarders who received teaching practice at local schools. The commercial school had over 60 pupils in 1840. In 1842 there were 42, of whom six were boarders. However, it seems that school was wound up in the late 1840s, possibly to provide more room for the teacher training school. At first, the training school found it difficult to attract pupils, and only 14 enrolled in the first three years. Throughout the 1840s and the 1850s there were 20 or more trainees, and at first the students were trained for national schools. In 1858, the Bishop of Lichfield, John Lonsdale (1788-1867), decided the training school’s main function was to produce village schoolmasters. But new regulations and financial problems eventually led to the closure of the school in 1863. When the school closed, Johnson’s schoolhouse of 1840 was handed over to Saint Mary’s girls’ and infants’ school. The story of Saint Mary’s School dates back to 1825, when subscriptions were raised to open an infants’ school in a new schoolroom in Sandford Street, west of Trunkfield Brook. The school was still there in 1834, but probably closed when the former parish workhouse, further east along Sandford Street, was converted into a parochial school for Saint Mary’s around 1841. At the time, the Vicar of Saint Mary’s was the Revd Henry Gylby Lonsdale (1791-1851) who was living at Lyncroft House, now the Hedgehog Vintage Inn on Stafford Road. His brother, Bishop John Lonsdale (1788-1867), was also the founder of Lichfield Theological College, a supporter of the abolitionist Wilberforce and a friend of the radical theologian FD Maurice. At first, the new school admitted girls and infants, but boys were attending by 1844. In 1851, there were schools for boys, girls and infants, with one male and two femal teachers and over 200 children. By 1860, the schools were for girls and infants only once again. Three years later, the teachers and children moved in 1863 to the schoolroom of the former diocesan training school at Minster Pool Walk. By the end of the 1860s, more than 200 children were at the school, and a new classroom was added in 1869. As numbers continued to rise, the infants were moved to a new school in Wade Street in 1876. Saint Mary’s infants’ school in Wade Street closed in 1913, and the children were moved to the new Central School on Frog Lane. Meanwhile, by the mid-1900s, school attendance in Pool Walk was over 170 and the building was overcrowded once more. In 1913, Pool Walk became a higher standard girls’ school. In 1921, the girls were moved to the Central School on Frog Lane, which became a mixed school and later became Lichfield Church of England Secondary School. In 1964, the 350 pupils were transferred to the new Nether Stowe school and the school on Frog Lane was closed. When the girls moved out in 1921, the school at Pool Walk became an infants’ school. This infants’ school took controlled status in 1951 and was closed in 1981. The building was then used by Lichfield Cathedral School from 1981 to 1989. The Lichfield Antiques Centre opened in the former school in 2010 and was featured on a recent programme in the BBC series, the Antiques Road Trip. The former school on Pool Walk is built of brick with buff brick diapering and ashlar dressings. There is a slate roof with a brick end-stack. The school building is a single storey, four-window range with a cross wing. There is an ashlar sill course and a coped gable with kneelers. The double-chamfered cross-mullioned windows have small-paned glazing, mostly of elongated octagons and squares, and plate glass opening light. The wing has a similar four-light transomed window, and the roundel above has an enriched iron grille above. The left return has a coped gable with a finial over two windows. Rear has simpler details. There is a lateral stack and a small gabled wing to the rear, and the archway to area has a plank door. The architect Thomas Johnson (1794-1853) lived at Davidson House at 67 Upper Saint John Street, from 1834 until his death in 1853. Johnson trained as a pupil of the Lichfield architect Joseph Potter (1756–1842) and was influenced by his method. Potter, who had a large practice in Staffordshire and the neighbouring counties in the late 18th and early 19th century, lived in Pipehill, south-west of Lichfield, but had his office in Saint John Street. Apart from restorations to Lichfield Cathedral, his work included Newton’s College (1800-1802), the Causeway Bridge, Bird Street (1816), Freeford Hall, which he enlarged for William Dyott (1826-1827), and Holy Cross Church, Upper John Street (1835), and his son designed the Guildhall (1846-1848). By 1814, the Potter practice was run from a house on the north side of Saint John’s Hospital. Later it was continued by his son, Joseph Potter, who died in 1875. Meanwhile, Thomas Johnson went on to work as a junior partner with the prolific Staffordshire architect James Trubshaw (1777-1853) of Little Haywood, near Colwich. Soon, Johnson married Trubshaw’s eldest daughter Mary. In 1828, Johnson and Potter worked on the nave of Saint Mary’s Church in Uttoxeter. But a year later, in 1829, Johnson set up his own practice as an architect in Tamworth Street, Lichfield, and he continued to design churches, including the very large Saint James’s in Longton (1832-1834). By 1834, he was living in the house that later became Davidson House in Upper Saint John Street. In 1840, Johnson designed the Lichfield Diocesan Training School and Commercial School at Pool Walk. Around this time, he came under the influence of the Cambridge Camden Society, which was strongly influenced by AWN Pugin. The early members included Canon James Law, a prebendary and chancellor of Lichfield Cathedral and a former Master of Saint John’s Hospital (1821-1826). Both Law and Johnson were founding members of the Lichfield Society for the Encouragement of Ecclesiastical Architecture in 1841, and both were active committee members. Canon William Gresley (1801-1876) of Saint Mary’s, a leading Tractarian, was the first chairman, and the committee met in Canon Law’s house in Market Street. In 1841, Johnson also began working on the restoration of Saint Chad’s Church, Lichfield, and he did further work there in 1848-1849. In 1842-1843, he worked with the London-born architect Sydney Smirke, who also designed the Hinkley family home at Beacon Place, in the controversial restoration of Saint Michael’s Church, Lichfield. During that work, the original memorial stone commissioned by Samuel Johnson for his family was removed as Saint Michael’s was repaved, and much of the mediaeval fabric of the church was lost. But Johnson’s restoration work is a remarkable example of the strong influence of Pugin’s ideas on his work, and the historian of Staffordshire Gothic architecture, the Revd Michael J Fisher, says it is a surprisingly god example of Gothic for its time. In 1844-1845, Johnson designed Saint Mary’s Church, Great Wyrley, two miles south of Cannock, in the Gothic style. In 1846, Johnson completed his rebuilding of All Saints’ Church, Leigh, two miles off the A522 between Cheadle and Uttoxeter. Johnson was also the architect of Christ Church, Lichfield, which was built in 1846-1847 on Christchurch Lane, just off Walsall Road. The church was designed in the Victorian Gothic Revival style and was consecrated on 26 October 1847 by Bishop John Lonsdale. Johnson’s other works in Lichfield include a wing, school room and front wall built ca 1849 at the former Lichfield Grammar School on Saint John Street. At the same time, he also designed the railway bridge crossing Upper Saint John Street, which I described in the Lichfield Gazette in 2013, and the Corn Exchange in Conduit Street, which opened in 1850. Today, the Lichfield Antiques Centre holds a wide range of vintage, antique, retro, collectable and period items from over 60 specialist dealers. The Lichfield Antiques Centre is at Saint Mary's Old School, Minster Pool Walk, Lichfield WS13 6QT. It is open 7 days a week, Monday to Friday 10am to 5pm, Saturday 10am to 6pm, and Sunday and Bank Holidays 11am to 5pm. ‘Lichfield: Education’, in A History of the County of Stafford: Volume 14, Lichfield, ed. MW Greenslade (London, 1990), pp 170-184. British History Online http://www.british-history.ac.uk/vch/staffs/vol14/pp170-184 [accessed 28 November 2017].